The latest Peter Gabriel live set is a release best suited for only the singer's true-believer fans, leaving listeners hungry for a proper Gabriel tour. All right. Let's get this out of the way first. If you happen to be a simple fly-by-night Peter Gabriel fan, someone who turns the the car stereo up a few notches whenever "In Your Eyes" happens to land on a local radio station and refers to him as only "that dude who made that neat video sometime in the '80s", then Live Blood, the recently released double-disc set featuring the former Genesis frontman singing songs in front of a 46-piece orchestra, is probably not something you will take a great deal of interest in. Or, in other words, you might as well give up on this review right now. Conversely, if you happen to fancy yourself a lifelong Peter Gabriel uber-fan who has an unwavering love for Tony Levin and David Rhodes -- two musicians who have been by the singer's side whenever he has toured for decades now -- and you prefer such deep cuts as "Moribund The Burgermeister" and "The Barry Williams Show" over such massive hits as "Sledgehammer" or "Solsbury Hill", there is one thing you must get through your head right now about Live Blood, the recently released double-disc set featuring the former Genesis frontman singing songs in front of a 46-piece orchestra: It's not nearly as bad or boring as you might think it is. Or, in other words, you might want to stick around for the rest of this review. There. Now that that's out of the way, we can proceed. Pretentious? Of course. Unnecessary? Without a doubt. A justifiable excuse for the singer to whine about his money troubles in an issue of Rolling Stone? Not really. 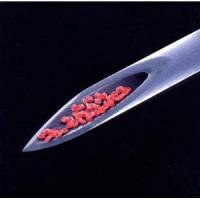 The quintessential Peter Gabriel live album? Pllllleaaaaassse (That award will forever go to his Secret World set by a mile). But is Live Blood an interesting, if not sometimes understated, interpretation of some of the songs that made the singer a household name all while exploring the depths of exactly how far one can take other artists' songs without completely ruining the idea of his recent Scratch My Back series? Sure. In fact, it's probably even better than that. Smartly, Gabriel knocks the newer songs out early in the set here, offering up a string from his Scratch project that is the bulk of the release's first disc. Paul Simon's "The Boy In The Bubble" takes all the life from the original and transforms an otherwise upbeat staple from Simon's classic Graceland into one of the saddest sounding performances of the evening. The singer's weathered voice does his version a tremendous amount of favors as he hauntingly repeats "This is a long distance call" over nothing more than a piano as his crutch. Magnetic Fields' Stephin Merritt's "The Book Of Love" is touching, too, with its heavy orchestral strings providing a wonderfully dramatic undertone for the performance. The singer tastefully plays it straight and concise, making Merritt's already poignant words that much more affecting. But back to those strings. The 46-piece New Blood Orchestra shines throughout most of this set and even at times overshadows the songwriting it is assigned to help interpret. The best moment comes from "Signal To Noise" from 2002's Up. The take is breathtaking and extravagant -- the only true reason Gabriel could have feasibly justified this tour. In fact, the singer even says so himself after the final notes boil over with epic proportions and the crowd erupts, proclaiming "That is the pleasure of having an amazing group of magnificent musicians on stage with you". The track has always been tailor-made for this type of interpretation, and fortunately for listeners and fans alike, the performance here exceeds all expectations. As for the rest of the night? Well, the performances never suffer, per se, from the lack of electric instruments or the world-rock percussive sounds that Gabriel has utilized so well in the past, but even so, it would be inaccurate and even a little disillusioned to say that something's not missing from the release as a whole. "Darkness", for instance, is a neat arrangement, considering how reckless it sounds in its original form, but it also suffers from the lack of the traditional drum set that has carried the song from its inception. "The Nest That Sailed The Sky" and "The Drop" also succumb to the inevitable reality that some of these interpretations are ultimately going to be a bit mundane. Musically competent as they may be, you are bound to comes across a few snoozers if you decide to do a project such as this. For the people who are in it for the more well-known tracks, some of them do pop up here, too, however mixed the results may be. "In Your Eyes" oddly falls flat, which is both surprising and questionable, considering the relevance that song still holds today both within Gabriel's current-day professional career and his legacy as a whole. It begins promisingly with violins and cellos suggesting an uptempo, feisty rendition, but as the first verse begins, Gabriel's voice stumbles through an off-beat time signature and a weird lack of connection to the performance as a whole. "Biko" and "Digging In The Dirt", meanwhile, are intriguing choices for a disc such as this, considering how they rely so heavily on percussion, though both succeed well enough to pass as different yet worthy renditions. And "Solsbury Hill" might just go down as the most memorable take on a song the singer has performed hundreds -- if not thousands -- of times. What makes this particular take so wonderful is the fact that the original version of the song was actually done without a proper drum kit. For once -- and, in fact, maybe the only time since releasing that song on his solo debut -- the track is interpreted properly, and while other live renditions have been admittedly more up-beat and pop-sounding, hearing this true-to-form version is not only a surprise, but it's also quite the treat. "I'll soon be home", Gabriel shouts toward the end of the track, a mild variation on the "I'm coming home" some may be accustomed to hearing in preceding live versions. The aged tone of his voice adds something to this particular recitation that simply hasn't been there before. Is it soul? Is it emphasis? Is it reflection? We might never know, and the unfortunate reality of Live Blood is that there might not be many more times that we get to hear such a line performed live again. Such is unfortunate because if we are going to be treated to Peter Gabriel tours sparingly from this point on, the truth is that hardly any of us would prefer it be under the caveat of this setting. Granted, this isn't the type of release aimed at fair-weather fans to begin with, but even so, Live Blood, in all reality, is nothing more than a vanity project aimed more at pleasing Gabriel's own ego than it is anybody else's preferences or hopes. Sure, it's a fine release for what it is, but it also serves as a reminder to even the most passionate of Peter Gabriel fans that the singer is at his best only when surrounded by the kind of electricity that made him a household name in the first place. It's a type of electricity that is vibrant. It's a type of electricity that is expansive. And most of all, it's a type of electricity that the singer should hopefully be able to find once he finally makes it home.